Back in September, Curtis Brown Creative announced details of a new scholarship for Welsh writers, the winner of which would receive a fully funded place on our Online Novel-Writing Course, taught by Commonwealth Book Prize-winning author Lisa O’Donnell. The Eluned Phillips Centenary Writing Bursary asked writers either born in Wales or currently residing in the country to send in the first 3,000 words of their novel, along with a one-page synopsis, from which the best would be chosen. They received more than 100 applications for that one place – the majority of which were of an incredibly high standard. Having had gritty stories of Cardiff lowlife and lyrical tales of life in the valleys; they had epics set in fantasy lands and mock autobiographies from the point of view of furry rodents. But the work of the winner, Rhian E Jones, really stood out. Rhian’s novel Kensington Gore was not only impressive because of its inventive plot about the rise of a Boris-like politician and his leadership of a UK in which the social gap is encouraged and rigorously enforced, but also because of the fresh, stylish writing and the subtle handling of a large cast of characters. ‘The winner seems a feisty young author, much in the same mould as Eluned,’ says David Llewelyn, a close personal friend of the late Sara Adeline Eluned Phillips (1914–2009), and who was instrumental in setting up the prize in her name. The bursary, a celebration of the centenary of the birth of the great Welsh writer, was raised by her family and friends – including David himself – and from the proceeds of a concert held to celebrate her life and work at Rhosygilwen Mansion in Pembrokeshire in 2012. Eluned, from Cenarth, on the Ceredigion side of the River Teifi, was only the second woman to win the Crown at the National Eisteddfod; firstly in 1967 and again in 1983. It was for this remarkable feat that she was most admired in her native Wales. She was known and loved as a wonderful storyteller and raconteur, and also for her sharp wit. Her stories of life in London and Paris, rubbing shoulders with such luminaries as Augustus John, Jean Cocteau and Edith Piaf – to whom she was a close friend – were legendary. Many of her stories are included in her memoir The Reluctant Redhead, published by Gomer Press (2007) and written in a matter of weeks on her trusty computer, ‘shenkin’, which she acquired at the age of 90. 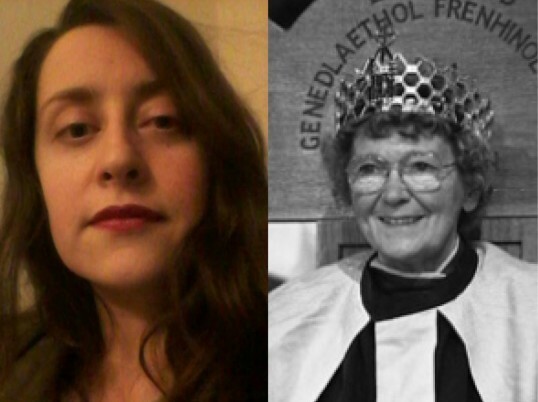 Rhian E Jones, winner of The Eluned Phillips Centenary Writing Bursary, grew up in Tredegar in the South Welsh Valleys. She attended Deighton Primary School and Tredegar Comprehensive. While at school she took part in several creative-writing workshops and other initiatives for young people, as well as being involved in local music and drama societies and the Welsh Labour Party. She worked briefly at Tredegar Library and as a clerical worker in a steel factory on the local Tafarnaubach Industrial Estate. After studying History and Politics in London and Oxford, she began work as a shop assistant in Soho while writing the blog Velvet Coalmine, which looks at history, politics, popular culture and the places where they intersect. She wrote the literary parody PG Wodehouse’s American Psycho for McSweeney’s Internet Tendency and has written for various other publications including The Guardian, Salon, Los Angeles Review of Books, The Morning Star, and New Welsh Review. Her first book Clampdown: Pop-Cultural Wars on Class and Gender (Zer0 Books), a critique of British culture and politics in the 1990s, was included in the Guardian’s Best Music Books of 2013.